In large bowl, mix sour cream, mayonnaise and Caesar dressing. Stir in cheese. Cover and refrigerate at least 30 minutes to blend flavors. Meanwhile, heat oven to 450°F. Spray jelly roll pan, 15 1/2x10 1/2x1 inch, with cooking spray. Place bell pepper, beans and cauliflower in pan. Drizzle oil over vegetables. Sprinkle with seasoned salt. Stir to coat. Bake uncovered 15 to 20 minutes or until vegetables are crisp-tender when pierced with fork. Arrange vegetables on serving plate. Serve warm with dip. 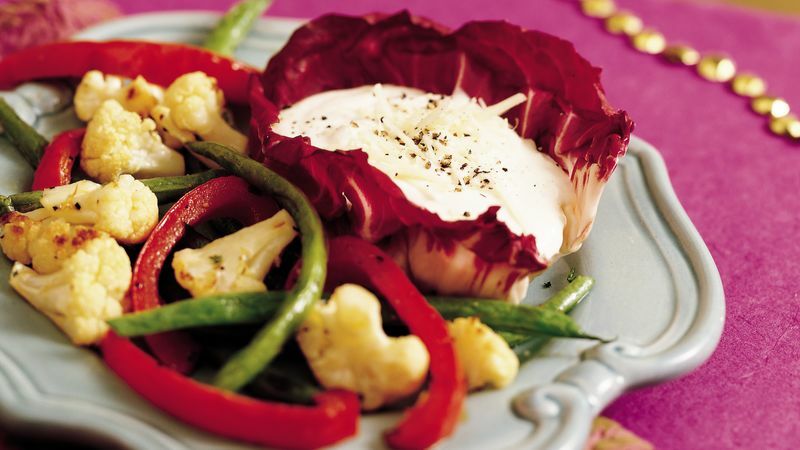 To save time, serve the dip with assorted raw veggies from the deli and skip roasting them. Serve dip in a colorful red cabbage leaf.